Academic qualifications: Degree (long-cycle) in Nautical Science and Maritime Transport from the University of the Basque Country and Master’s Degree in “International Shipping and Physical Distribution” from Plymouth University. Professional experience at sea onboard merchant and reefer ships as First Officer and Master working for Navieras Aznar, Transoceánica, Transmar and Transmarina for thirteen years. 1991-199: he worked as Chief of Staff of the Basque Shippers Association. 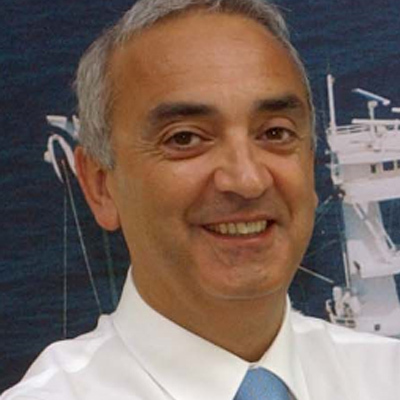 From 1997 to the present: General Manager of the Basque Maritime Forum. “Registro y abanderamiento para la flota mercante vasca” [Registration and flagging for the Basque merchant fleet] for Bilbao Chamber of Commerce. “La Marina Mercante en el País Vasco 1960-1990” [The Merchant Navy in the Basque Country 1960-1990] for the Maritime Administration School of the Basque Government..
“Diagnostico y posibilidades de colaboración o cooperación con América Latina en el Sector Maritimo Pesquero” [Diagnostics and opportunities for collaboration or cooperation with Latin America in the Fishing Maritime Sector] for the Department of Employment and Economic Promotion of Bizkaia Provincial Council. “Organización del trabajo a bordo de los buques que posibilite una mejor adaptación ergonómica y un mejor aprovechamiento del marino” [Organisation of the work onboard vessels that enables better ergonomic adaptation and better use of the seaman] and “Haizalde- Barlovento , el mar y los vascos entre América y Trafalgar” [Haizalde-Windward, the sea and the Basques between America and Trafalgar” both for the Maritime Affairs and Ports Directorate of the Basque Government’s Department of Transport and Public Works. Opinion articles: related to the maritime sector in professional journals, newspapers, radio and television.